Jun. 25 2016 about Disney's Tanabata Days 2016. Jun. 19 2016 Disney's Egg Hunt for a Geek. Jun. 11 2016 about Disney's Easter Egg Hunt for Begginer. May. 28 2016. about Still Can Enjoy Easter at TDL! May. 08 2016. about TDS 15th Anniversary. Apr. 16 2016 about Disney's Easter in 2016. When do you wish upon a star? Many Japanese people do it in July 7th. This day is called "Tanabata" the annual ceremony. In TDR also wish everyone's peaceful days from June 16 to July 7. The big Tanabata decoration with bamboo trees set in World Bazaar. We celebrate a romantic once-in-a-year-meeting of Altair prince, called Hikoboshi and Vega princess, Orihime in this day. Hikoboshi Mickey & Orihime Minnie is so pretty with gorgeous dresses. The back side of Mickey & Minnie, there are also Donald & Daisy dressed Tanabata costumes. 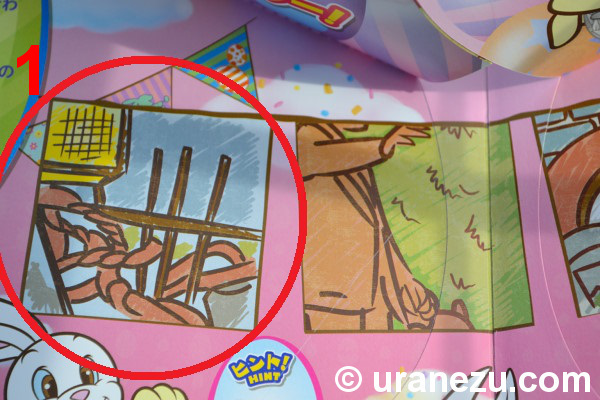 Donald try to hang Daisy's wishing card to the bamboo. In Tanabata custom, we write each wish on a rectangle paper, and put it on the bamboo. In TDR, a cast member gave a beautiful Mickey-shape wishing card during Disney's Tanabata Days. Yellow wishing card at TDL, Blue with 15th anniversary mark at TDS. And pink is a guest of "Celebration Hotel" the latest and moderate Disney official hotel in TDR. 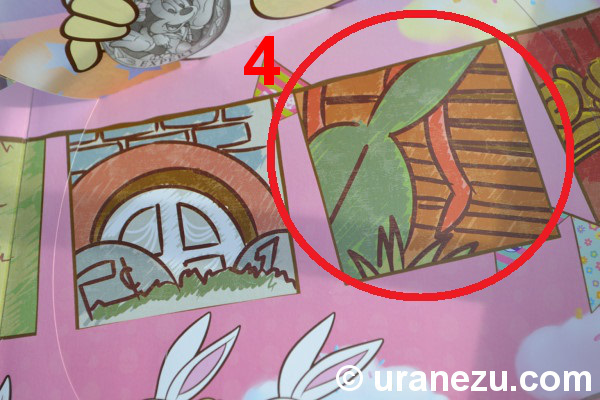 Did you see the same Mickey-shape cards in a red circles? They're Disney friend's wishing cards. So let's sneak peek what do they wish. In every year, each wish has expressed their character, but in this year every cards are little bit boilerplate message. Except Mickey. Mickey always wish as perfect leader. Because every character have to use "WISH" the TDS 15th anniversary theme. Donald always wrote lovely selfish wish. And Goofy wished about his family in every year, but they seemed give up it in this year because of the untold rule. 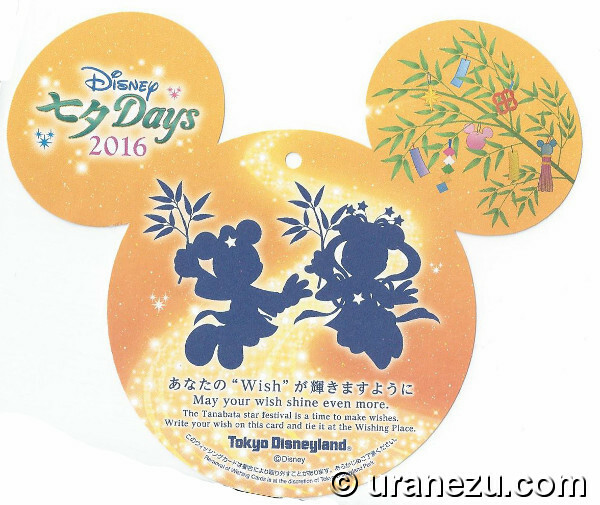 Chip & Dale is very popular in Japan, so their wishing cards have appeared in this year! And my favorite fun in Tanabata is Pluto's wishing card. Did you know Pluto is Mickey's pet dog. Can you believe his fantastic ability? I can't write the shining mark as beautiful as Pluto's! And surprisingly, he understood a "Crystal" is also the theme of TDS 15th anniversary. You are wonderful, Pluto. Am empty rack at "Wishing Place" is covered with so so many guest's wishes. TDS also has "Wishing Place" the Tanabata festival area in American Waterfront. A pigeon always perched on the board. This is the "Wishing Place" at TDS. The area at TDS is smaller than TDL's, but it's nice scenery with Tower of Terror or S.S. Columbia. On the way to "Wishing Place", there are some special banners under the elevated tracks of "Electric Railway". Golden Afternoon ladies from "Alice in Wonderland" banner which designed Japanese style. It's very beautiful design on a traditional Japanese textile pattern. Another banner is fantastic Cleo design. I'm waiting some merchandises which used these design! And Hikoboshi Mickey and Orihime Minnie. then only you can see special Mickey & Minnie like this. It's really blur, but watching Milkey Way from center of Tokyo is just like that. So it is OK.
"Tanabata Greeting" the special water greeting uses arranged song of "Wishes" the fireworks. So the song and lyrics gave me an extraordinary emotion always. I really love this song. So let's go back to TDL! It's sunset! The all decoration with bamboo are lit after dark. Every direction is romantic in the night. In the evening, a carving bamboo lights are so beautiful. I wish we'll be able to live in harmony. Jun. 19 2016 about Disney's Egg Hunt for a Geek. I posted Easter's Egg Hunt for beginner at TDL in last week, so let's step up to challenge. In 2016 TDL, they have prepared 2 more courses for a park explorer. The names of course which will satisfy an inquiring mind are for Expert and for Master. 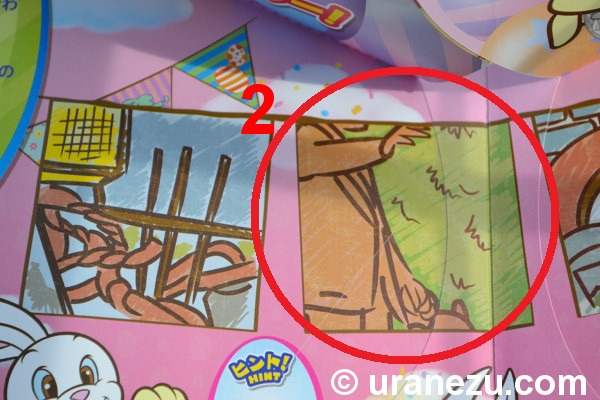 The both course is each 1,050JPY for one egg hunting sheet with stickers, and one special egg-shaped medal as a reward after you found the whole beginner's eggs. So, let's begin to for Expert course. You have to guess a hiding place from a picture and hint as below. The word hint is "It's like a cave! ", "Magnificent! ", "Lawn", "There is a postbox nearby", and "It says 1876". Before you stroll the park randomly, it’s better to surmise the hiding place and egg. "1876" the hint bring clearly one thing to mind, the time around of western golden era. So let's go to Westernland. There is "1876" on an exterior of "Western Wear" the apparel shop. A green of image No.4 looks cactus. Yes! There it is the Dunny the sheep egg! The red thing of the image is Kokopelli's leg! The next imaginable that the hint word of "There is a postbox nearby". I think it doesn’t mean the real post, so only one place to go is Toontown. In front of the Post Office, I can find the little bird egg in a window of "Gag Factory, Five & Dime" the merchandise shop. The No.3 is the facade which is decorated big coins. So only left 3 eggs now. Do you remember a plant of image No.1! It might be thorn, but TDL is Cinderella castle, not Sleeping Beauty's and even not have a dragon under the castle. So I think a country related with a laughin' place. There is a small cute merchandise shop in TDL Critter Country the area of Splash Mountain. An acorn egg at exactly the right place of the image No.1! The image No. 2 is very easy, but little bit tricky for me who believed the picture itself. The image is view from the left side. But the pretty bird egg is located in another side! I searched and searched left side lawn! The last hint word is also tricky for me, because the hint in Japanese means "grand success! ", this word is popped an image of "Penny Arcade" in my mind. I assumed "Penny Arcade" is the right place. But thinking the English hint "Magnificent!" deeply, which evoke a magic. Finally, reached at the same Mickey icon in a display window at "Magic Shop". When levitation is worked by Magician Mickey, then the last egg has appeared! That's all the Expert course. How do you feel it? Difficult or not? Let' proceed to the most difficult egg hunt, it's Master course. The word hint is, "An item to tell time", "Net", "Bear", "Water Wheel", and "Magic". So, seeing from above word hint, most easiest place to guess is "An item to tell time". Let's go to in front of the thing what hint expressed. See? It’s a street clock in World Bazaar. And the exactly right place same as the image No.1, but where is hiding egg? Oh, so micro crystal egg! The word "Magic" is a big hint for me, so I can see a place. And I found the same pattern of image No.5. 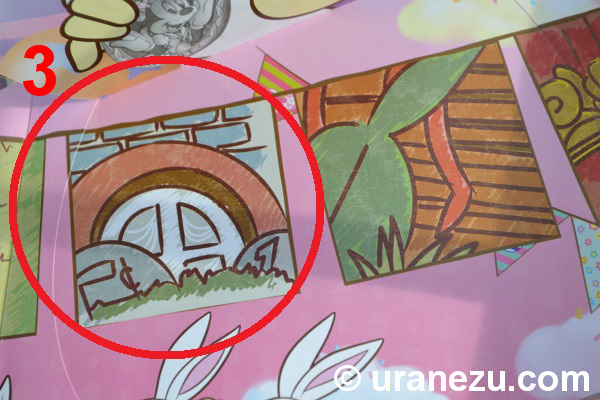 There is a hiding Easter egg in this attraction exterior. Wow, one of the crown Jewel is changed to golden egg! I really love this hiding place and egg! 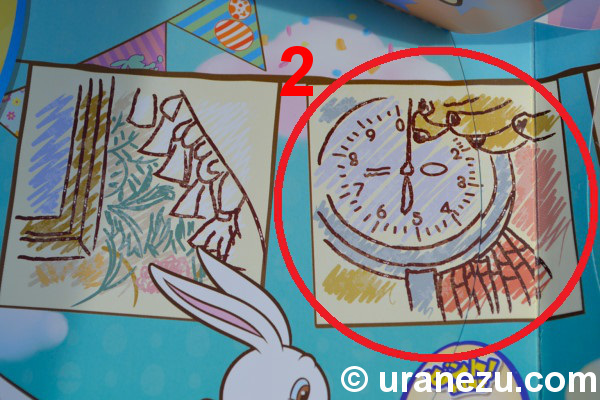 The image No.2 looks hanging clock, but inspects deeply, you can see banana. This tropical fruit gave me a direction of an egg. So let’s go to Adventureland. Soon you’ll be able to see a scale, not watch at "Fresh Fruit Oasis" the wagon. And I think an egg which was hid in here might be fruit-like egg as above sticker. The egg wrapped in a net above a cast member. Oh, that’s why a hint of the egg is "Net". Last two eggs! Where can you imagine the place from "Bear" the word hint. The attraction "Country Bear Jamboree", Brer-Bear from "Splash Mountain", or Polar bear from "ISW"? But there are still left a bee-shape egg stickers. Yes, it's Winnie the Pooh! But I can't find the egg at an exterior of "Pooh's Hunny Hunt" the attraction, and around of the area. So I have to go and seek INSIDE of "Pooh's Corner" the merchandise store which is popular and busy all the time. A lamp as same as the image No. 4. So, inside the store is the right place for the egg. There is the bee-egg in bunch of bees at a top of the merchandise honeycomb shelves. It's cute egg, but I don't think it's the best hiding place in such a pack of many guests. It's really almost there, the last egg! Let's think a barrel of image No.3. This type of barrel and lump is definitely Westernland’s belongings. I found the exactly as same place as image No.3. But there are no eggs! And as a witness, the word hint which is only left is "Water Wheel". There is no "Water Wheel" in the exterior. So "Country Bear Theater" is a wrong place. There are some Water Wheels in TDL, a bamboo water wheel at Swiss Family Treehouse,　Harper’s Mill in Tom Sawyer Island, and big one at Critter Country area. However every water wheel is not in Westernland. Olaf egg at Swiss Family Treehouse. Brer Rabbit, Brer Bear, and Brer Fox from Critter Country area. I checked all water wheels in the good old days structure in TDL, but I couldn't find. Therefore, there is one need to inspect a place closely, it's newly additional things. I admit it's really fantastic design, but my least favorite thing, it's a vending machine. This is still new for me in TDL. Look! There is a water wheel! A big rock-shape egg is whirling in the water wheel! We did it! Found all master-eggs! 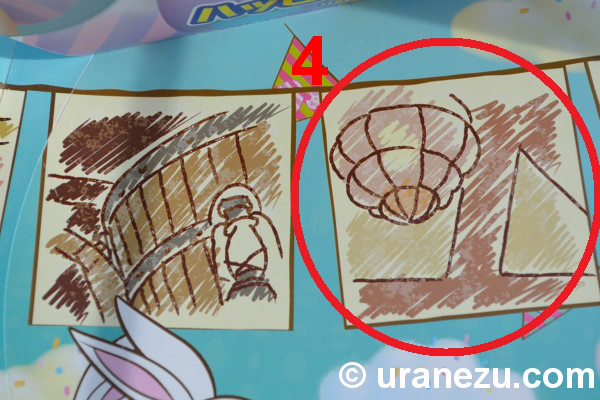 If you find all eggs on the sheet, let’s go to a goal with the Easter map and get an egg medal. Silver Minnie medal for expert, Gold Mickey one for master. Did you have a good time with the Disney’s Egg hunt for expert & master? Finally, left only a week to end of Disney's Easter the three-months-long special event at TDL. So I think it's time to show you 2016 Disney's Egg Hunt the paid park-wide game. This egg hunt became popular extra-charged game in TDL. In couple of years, the game had two courses, For beginner and for expert. The game for expert was changed their egg places in every month, so we could enjoy 3 times during the event. In this year's egg hunt has changed. After this changing, shortly said, plus is the course has increased to three courses, which are for beginner, expert, and for master! The con is the expert or master egg's place isn't change in three months. The beginner course is 510 JPY for one egg hunting sheet with stickers, and one special egg-shaped pendant as a reward after you found the whole beginner’s eggs. 2016 beginner's egg is completely new design which is waiting for you in a various area at TDL. Mickey and Minnie with Easter costume is welcoming in front of World Bazaar. Not only try to find the Eggs, but also enjoy beautiful vegetation and flower with the eggs. It's great place to hide Gus & Jaq egg. Small of the two are located near an entrance of Glass Slipper the crystal merchandise shop in Cinderella Castle. Their flower bed enchanted to two-tones flowers from a bark chips. And another little two is in an outside dining area of Cafe Orleans the crape eatery. This new chef style Chip & Dale are replaced from so adorable amazing wonderful my favorite Lady & Trump. The below picture took from the last year's Easter. It's so lovely, isn't it? Unfortunately, we cannot see this beautiful egg in any place at TDL. Not only in the below flowerbed or bush, but also they are stay up above. Yes, they are egg, but bird, so perched on the rail of second floor. Jose Carioca and Panchito Pistoles from Diamond Horseshoe the restaurant. Donald and Daisy is located in center of Toontown. I love Daisy's purple bonnet. Don't forget to find out another Disney friend in Toontown. Painter Goofy egg from Goofy's Paint n Play House. Speaking of dog, I think I see a blue puppy like egg in Tomorrowland. He looks so happily around same color flowers. Seeing from back, a big and white egg, it looks just normal. It's Baymax egg! This huggable appearance heals us even without any special treatment. The last egg of the beginner is a fast-rising star. Yes, Nick Wild & Judy Hopps the buddy egg from exit of Mark Twain River. If you find all beginner eggs, let's go to a goal with the Easter map and get a character egg pendant. That's all the beginner egg hunt. It's very easy! So let's level up to expert in next week! May. 28 2016 about Still Can Enjoy Easter at TDL! Oh, I wish you were here, still you could enjoy Easter in TDL! So I'd like to share some funderful pictures from "Hippity-Hoppity Springtime" the special parade with you! The white rabbit dancer with colorful flowers from Minnie's float. Lovely! Special Easter Minnie is also cute. Purple daisy umbrella flower dancer came after the Minnie's float. The patal layer skirt is so gorgeous! Energetically aerosol painter dancer follow the artistic float. Of course, Mickey and Donald dressed up special Easter costume! It's really happy to meet Winnie-the-Pooh Rabbit! Around Teacher Rabbit float, there are many cute student rabbit dancers. Miss Bunny on the beautiful flower float. A flower dancers are also beautiful! Cup cakes skirt, whip cream collar, and sugared shoes! Marie the cat on the very last float. Not only the fabulous costumes, but their dance is so fantastic! May. 08 2016 about TDS 15th Anniversary. TDS has opened in 2001. Wow, 15 years have passed since completely new theme park has created as a second Disney parks in Japan. The actual opening date of TDS is 4th September, but happily anniversary event brought forward. TDS is now celebrating 15th anniversary! TDS ticket booth facade is adorned with special 15th anniversary banner. I always use a word "special" for a time-limited decoration in each seasonal event. 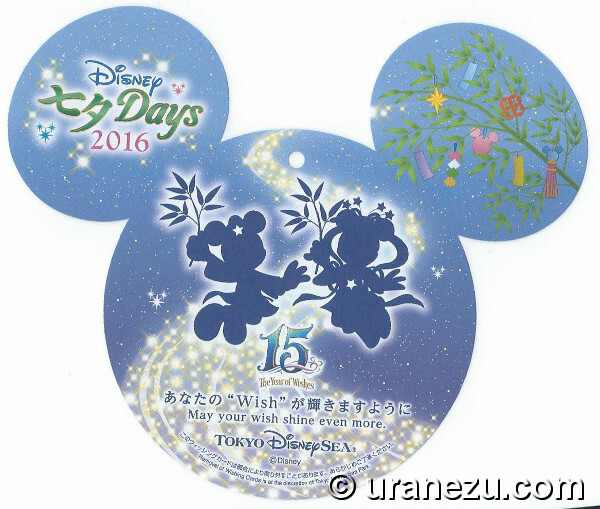 But this ornament is a really special, there is no perfect word “special” for this TDS 15th anniversary decoration. A kind of nostalgia from steampunk-like design with small squeak sound. It's so big, and fantastic. Say good bye the wonderful ship for a moment, let's explore the park. The exterior in front of the Mediterranean Harbor has also beautiful banners. This anniversary year is "The Year of Wishes". The column is simple at this time, but the plainness gave us another sight. I realized how the original details are beautiful. Above a special banner, down below a colorful show window. The 15 th anniversary window from Emporio the merchandise shop. Seven Colors crystals distribute to Disney characters. Mickey: A crystal clear and pure. For everyone's wishes to come true! Minnie: Wishes for love shine in this red crystal! Pluto: An orange crystal is a wish to bring smiles to all. Donald: A blue crystal is a wish for friendships true. Daisy: Wishes for Joy shine like a purple crystal. Goofy: A wish for energy becomes a green crystal. Chip & Dale: A fun wish is a yellow crystal the color of acorns. The crystals are also installed as a photo location in all around the park. And if you got a compass, you’ll enjoy a reaction with lights and sounds at each place. Chip & Dale Crystal point from Port Discovery. Minnie Crystal point is located at Waterfront Park in American Waterfront. This area has Minnie statue in front of the crystal. Here are another crystal point in American Waterfront. The big anchor crystal point at Arabian Coast. This big point has Donald's statue. Lost River Delta has Pluto's crystal point. Marvelous scenery from Mysterious Island with Goofy crystal point. Goofy bend the knee to a guest who get the Crystal Compass. And last crystal point from Mermaid Lagoon. And the compass is also light up when used while viewing "Fantasmic!". Unbelievable the "Crystal Compass" is ¥3,000. It's expensive for a small souvenir, so I'd like to introduce other merchandises. I mean the price is not bad as its size, it's ¥1500JPY. Regularly, TDR pins are sold for about 800 ? ¥1,000. The mat board of the 15th pin is 12cm X 10.5cm. Big but nearly regular price is celebrating! Also special 15th button is bigger than the other. Unfortunately, there are no give away button in TDS and TDL. So it’s nice opportunity to purchase the button, because it’s bigger than usual! The regular button is 300JPY, the 15th anniversary button is ¥500. Speaking of pins and button, the cast member's name tag is also special! Every casts picked their favorite Disney character for the name tag. It's fun to see their character. We can see this special name tag until 17 March 2017! A festal season of egg & bunny has come back at TDL. This event is named "Disney's Easter" officially, but how could we call "Easter" which runs longer days than fifty the Eastertide? TDL Easter event has started from March 25 to June 15. Through an entrance gate, first thing our notice is a special decorating flowerbed. This year’s theme of Disney’s Easter the special event looks Sports Day than Easter. Coach Mickey give a pep talk to a bunny. Minnie the cheerleader with pom pons is cute. I think Micky and Minnie looks less avid expression compare from the barbell bunny. The chip in cabbage patch special decoration has appeared near Crystal Palace Restaurant. 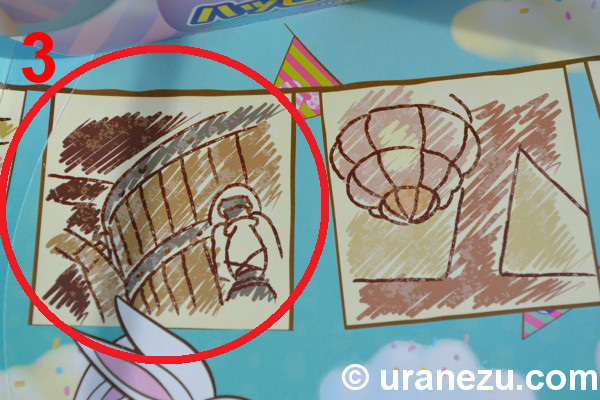 There are two photo location in the hub. But I really don't understand what the story of this decoration. Daisy please tell (poor) me the situation of this! And the other side of area is scene from egg and spoon race. Pluto also participates in the race. The goal is waiting for them! Cute, but it feels like Sports Day than Easter. Show windows are also Sports Day-like atmosphere. "Presented along the parade route will be "Hippity-Hoppity Springtime," a fun and entertaining parade themed to a "secret Easter garden." This year, Mickey Mouse, Minnie Mouse and their Disney pals will be appearing to new music wearing new costumes with bunny ears. And when the parade makes a stop, it’s time for you to join in on an exciting egg race!" I was little bit confused what the Easter is. Because a music changed to “Galop Infernal”(AKA the music of can-can dance) when a show started after the each float stopped. Anyway, Enjoy Disney's Easter at TDL!